Infiniti takes on the bottom end of the luxury market. 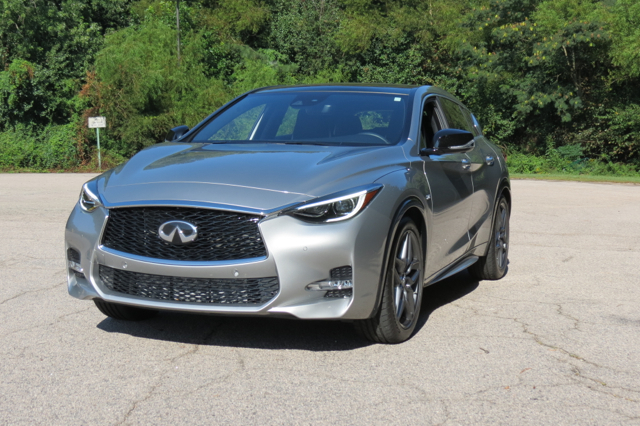 The smallest of all Infiniti models is this QX30 crossover. America’s insatiable appetite for crossovers hasn’t been lost on manufacturers, including luxury brands such as Infiniti. The Infiniti QX30 is the latest model from Nissan’s luxury brand, a compact crossover with a strong hatchback vibe. Introduced in 2017, the QX30 is based on the Mercedes-Benz A-segment platform, the same architecture supporting the GLA250. The partnership between the two luxury marques launched in 2010, with the current-generation GLA arriving five years later. The exterior styling, cabin design and the powertrains are unique to Infiniti. 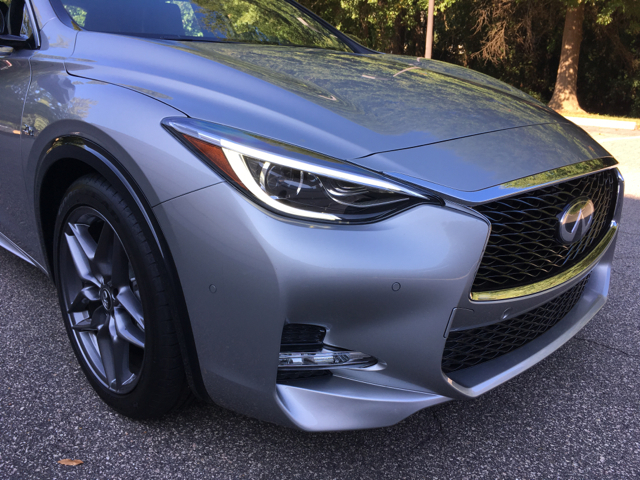 The suspension is sport-tuned for the QX30 and the infotainment system, while resembling the Benz’ COMAND unit, has a definitive Infiniti edge. One year removed from its debut, the 2018 QX30 is unchanged. Prices held firm too. The 2018 QX30 is offered in six grades: Base ($29,950), Luxury ($32,600), Luxury AWD ($34,400), Premium ($35,300), Premium AWD ($37,700) and Sport ($38,500). Front-wheel drive and a turbo four-cylinder engine are standard. Add $995 for the destination fee. My test model was the Sport, the top of the line front-wheel drive model. Infiniti added radiant illuminated kick plates ($465); a Sport Technology Package with blind spot warning, lane departure warning, forward emergency braking, high beam assist, and intelligent cruise control ($1,200); a Sport LED Package with LED headlamps, adaptive front lighting, and LED ambient lighting ($1,000); and a Sport Leather Package with Nappa leather seats, suede-like headliner, and heated front seats ($1,500). All told, my final price came to $43,660 and that’s a few thousand dollars more than the top-end GLA. True to their agreement, the Infiniti QX30 and Mercedes-Benz GLA put forth their own designs. There is no confusing these two models. The QX30 has familiar Infiniti design elements such as the brand’s signature gaping grille and hawk eye LED light treatments. Front to back there is much body sculpting and character lines present as well as a rising belt line and now ubiquitous zig-zag roof. From the rear, the hatch feel of this model is evident with a liftgate spoiler, wraparound tail lamps, and available diffuser-like trim with dual exhaust ports. This model has rear fog lights; front fog lamps are available. Standard exterior features include halogen headlights, automatic headlights, LED daytime running lights, an aluminum hood, power-folding and heated side mirrors, and dual chrome exhaust finishers. Available features include LED headlights, an active front lighting system, and roof rails. 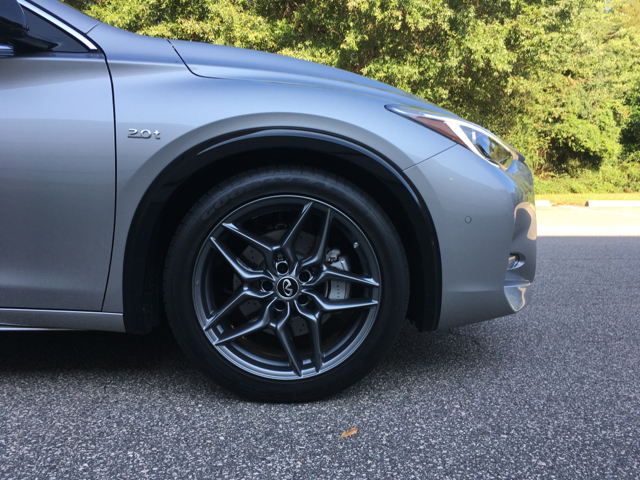 The QX30 comes with 18-inch aluminum-alloy wheels wrapped in all-season tires. You can also choose 19-inch wheels set within summer tires. Overall, the exterior look is sporty with lighting, body sculpture and chrome embellishments giving the QX30 a premium persona. The 2018 QX0 offers room for five, but four is ideal. 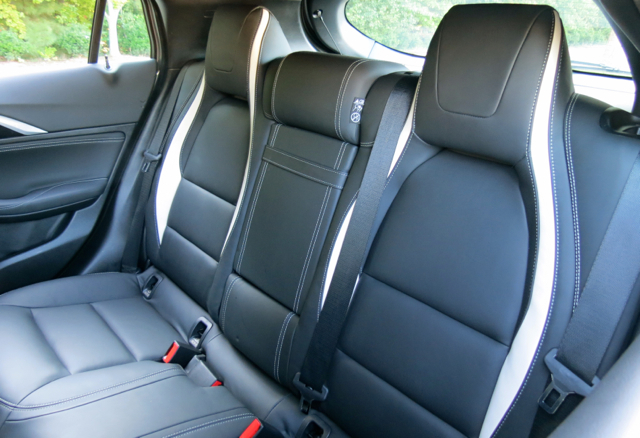 Even then, if you have tall passengers sitting in the rear seat, things tend to get a bit cozy back there. Standard storage space measures 19.2 cubic feet; fold the rear seat and you’ll more than double that capacity. 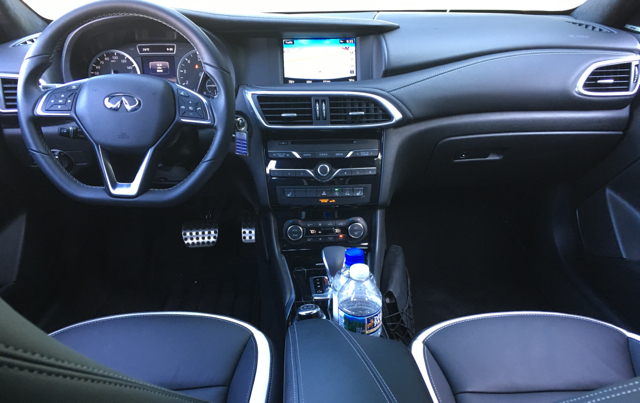 Infiniti’s touch is all over the interior, with cloth, imitation or fine leathers, suede, and available dark wood available, providing luxury touches. 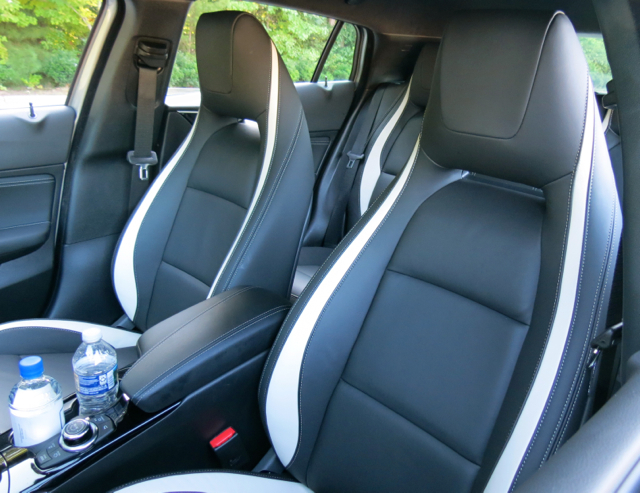 The fit and finish are first-rate, the front seats are very comfortable, and the cabin is quiet — for the most part. Yes, highway noise seeps in through the front windows, but otherwise the cabin offers the solitude expected. You need to move away from the base model to enjoy the many amenities this model offers, including power front seats, heated seats, aluminum kick plates and pedal finishers, and rear reading lights. 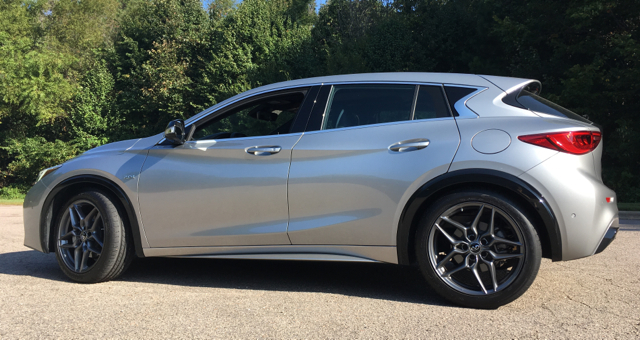 In all, I see the QX30 as an ideal model for people first entering the luxury sphere, although that means a crossover, not a sedan. But then this crossover has the utility customers prefer, something no sedan offers. You won’t find safety ratings from the Insurance Institute for Highway Safety (IIHS) yet on the QX30. Similarly, the National Highway Traffic Safety Administration (NHTSA) has yet to conduct its own tests. Beyond the usual suite of airbags, Infiniti also has knee airbags for the driver and front passenger. Blind spot warning, lane departure warning and forward emergency braking are available. A rearview camera is standard. Opt for the Technology Package and you’ll find intelligent park assist, a system that utilizes 12 sensors to determine if a parking spot is the right size. If it is, the QX30 can park itself. All 2018 QX30 models come with a 6-speaker audio system with two USB ports, an auxiliary jack, CD player, satellite radio, and HD Radio. Bluetooth connectivity is also standard. 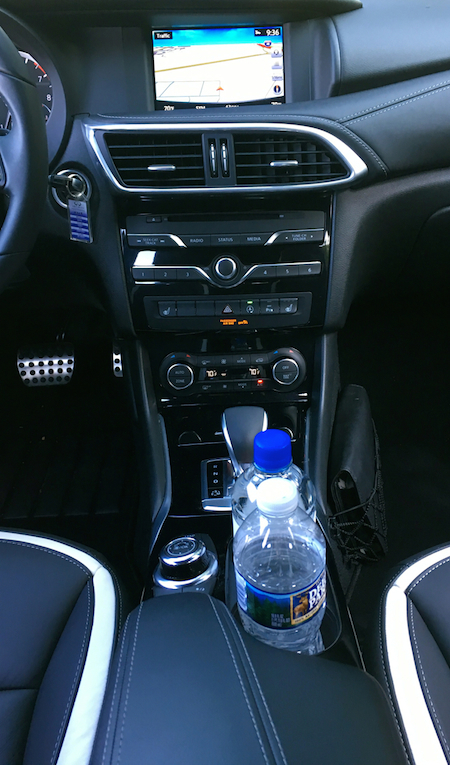 Upgrades include a 10-speaker Bose audio system and Infiniti InTouch with navigation. The InTouch package brings in a 7-inch touchscreen display with traffic reports and related apps. The navigation system worked without drama, bringing us from point to point with accuracy. 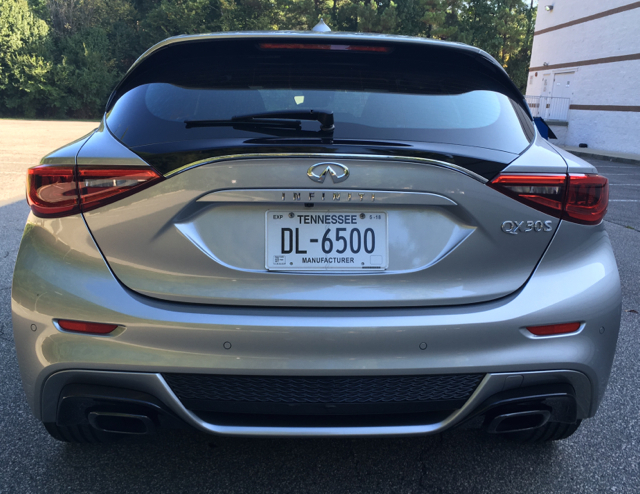 Infiniti provides just one powertrain combination with the 2018 QX30: a 2.0-liter turbocharged four-cylinder with 208 horsepower and 258 pound-feet of torque. Working alongside this engine is a 7-speed dual-clutch automatic transmission. 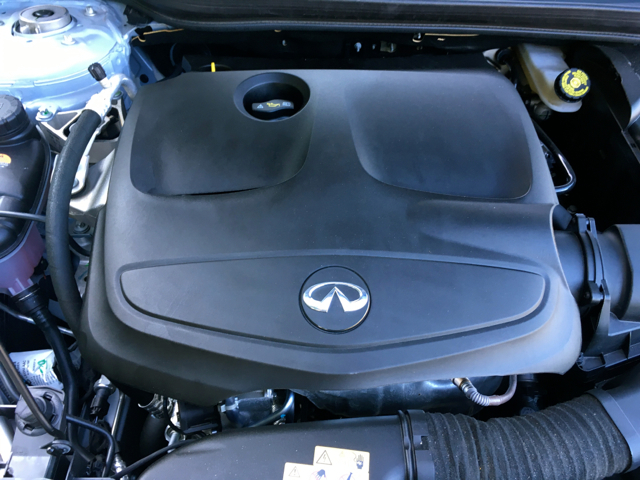 I’ve driven other Infiniti models with this engine and found it wanting. The reason has everything thing to do with size and weight. In the QX30, the engine is spot on. As fortune would have it, the QX30 arrived the day before I needed to take my son and another player to a soccer game near Wilmington, NC, a 254-mile round trip excursion on a Friday afternoon. Turns out the journey offered a fantastic opportunity to gauge how the QX30 drove, rode, and handled. And I wasn’t disappointed by the experience. As expected, the QX30 moves away from a dead stop cleanly. Floor the accelerator and after a brief pause, turbo power is at the ready. From a fuel economy standpoint, I made the mistake of not going with Eco mode. But Sport mode unleashes this small crossover in a way that’s wholly satisfying — potent power and a surprisingly comfortable ride for such a small vehicle. Weighty steering and crisp handling are two more attributes that make this driver worth considering. Fuel economy comes in at 24/33 mpg city/highway with front-wheel drive, but just 21/30 for all-wheel drive. With the QX30 in its lineup, Infiniti offers first-time luxury shoppers a compelling reason to consider the brand. Prices can zoom up very quickly once you move past the base model. Start at the Luxury trim and you’ll get a fairly well-equipped model for about $33,000. That said, if you want amenities such as navigation and driver-assist features, these come as package options available at the Premium level. Choose the packages and your final price tops $41,000 and that’s $11,000 more than the base price. Besides the GLA, competing models include the BMW X1, Audi Q3, and the Lexus NX200t. If you’re looking for a sedan, the compact Q50 begins about $35,000.